They are the stuff childhood dreams are made of: country cottages with roses round the door, welcoming, homely and with the prettiest gardens to match. Who wouldn't want to downsize to a cosy cottage under a thatched roof? Humble abodes with simple interiors and country retreats in honey-coloured Cotswold stone, there's something here to suit every taste. Join us on a tour of Britain's cottage heritage. See more beautiful real homes on our dedicated hub page, and find out how to renovate a house in our essential guide. This remote stone farm cottage in North Yorkshire was full of potential, but was unbearably cold in the bleak Dales winters. The new owners fitted secondary glazing to the draughty timber sash windows and repointed the external stonework. They also had to have the chimneys rebuilt. Inside, the decor is simple and calm, allowing the home's beautiful original features - including a stunning cast-iron cooking range - to speak for themselves. See more extension ideas for period homes in our guide. 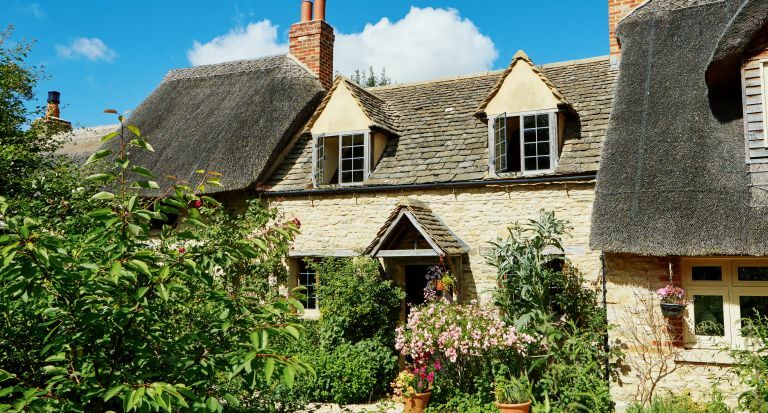 It is hard to imagine, looking at this picture-perfect thatched cottage, that the original section – one upstairs room, one downstairs – was built in just one day. This is a so-called 'squatter's cottage', dating back to 1725. Common Law of the time declared that if a house could be built within 24 hours, with smoke coming from its chimney at the end of the day, then the builder could claim the land as his own. The cottage has been added to in subsequent centuries and the current owners have taken care to preserve the period features, while adding a new bathroom, updating the kitchen and freshening the interiors to make a homely, welcoming space. See inside the squatter's cottage. Find out how to repair and maintain old roofs, including thatch, in our guide. This pretty riverside cottage was built in 1840 in the local Derbyshire limestone and has one unique feature - a sturdy outhouse was once the village lock-up where unruly drunks would have been kept overnight! Other period features preserved by the owners include quarry tiles, beams, and a huge inglenook fireplace. The house originally belonged to to the village stonemason and its new owners like to think that he would be quite impressed by their new reclaimed stone-built extensions to the property that provide a dining room, garden room and cloakroom. Use our expert guide to find out how to choose new windows for your period home. Built in the mid-17th century as part of a row of seven farmworker's dwellings, the main, central section of this part-thatched cottage had collapsed and had to be rebuilt. Its architect owner gradually pieced it back together again, using traditional methods, and modern or salvaged equivalents of the materials used when it was first built. See inside this 17th century cottage. Find out how to maintain and repair windows and doors in period homes. Grade-II listed and in a conservation area overlooking the green and duck pond in an idyllic village on Dorset's Jurassic Coast, this pretty cottage left its owners few options for extending. It had once belonged to the village shoemaker and cobbler who had lived a spartan existence. A new wood-burning stove in the living room, and a new floor and Aga in the kitchen soon made things more homely, and eventually a modest extension, just 10 square metres, provided more space in the kitchen-diner and extending the roofline to add a dormer added much-needed space for the master bedroom. Stand on tiptoes in here and you can see the sea. Read our essential guide to converting a loft for more information. This lowly lochside croft on the west coast of Scotland has been remodelled to create a comfortable home full of traditional charm. The property had been empty for seven years and was near derelict. It was the oldest house in the village, built in 1780 as a two-room croft with one room for animals and one for the family. The cottage had been extended in the 1950s when the original thatched roof was replaced by a corrugated tin one. Once the major renovations were complete, the owner turned her hand to the garden, now an impressive potager and flower garden. Take the tour of this Scottish croft. See more inspiring kitchen gardens in our gallery. Originally a cowman’s cottage, part of the country estate of Ditchley in Oxfordshire, this double-fronted Cotswold cottage has four bedrooms. Inside, there is a striking wall of exposed stone with a traditional inglenook fireplace, adding to the building’s charm. Browse these traditional fireplace design ideas for inspiration. Built in the 1890s, this Victorian worker’s cottage is home to which Louise, who owns a vintage and antiques shop. She has filled the two bedrooms and two reception rooms with a wide variety of vintage curiosities and beautiful finds gathered on her travels around the world. The house has a mix of bay and sash windows, in the typical a-symmetrical style of this period. Read more about how to renovate a Victorian house in our expert guide. After travelling the world for a couple of years Sonja and Kevin Bergin decided to buy a home in the Irish countryside, where Kevin had spent a happy childhood. They chose a thatched stone-built cottage and have been renovating for the last two decades. Take a tour around their early 1700s thatched stone cottage. Find out more about lime mortar, plaster and wash: how to use it to repair and maintain your period home's exterior in our expert guide. Set in the countryside of north-east Oxfordshire, this Grade-II listed house was built in 1806, and was extended in 1902. The five-bedroom cottage is built in Cotswold stone, and the interior contains period features including ornate plasterwork. Find out more about renovation costs for your project in our expert guide. This mud-and-stud cottage in Lincolnshire nestles under a thatched roof and has a later yellow-brick addition added in the Victorian period. The interior features wooden beams and an unusual ‘witch’s hat’ shape fireplace in the dining room. Use our period home maintenance calendar to keep your home looking just as neat. This solidly built Peak District property dates back to 1550, with a stone-built extension. The exterior has a white render, while the interior features wood-panelling and exposed beams. Read our beginner's guide to rendering to keep your home looking smart. This idyllic Gloucestershire cottage has a Grade-II listing, as the oldest parts of the house date back to the 14th century. Inside there is a wealth of original features, including beams, flooring, and an original fireplace. Find out how to choose the right windows and doors for your period home. Situated on the Knebworth Estate in Hertfordshire, this historic home is built from a timber frame and thatch. It has a Grade-II listing, and the oldest part of the property was built 400 years ago as a woodman’s cottage. It was extended in the Victorian era to become a folly. Find out how to design a kitchen for your period home.